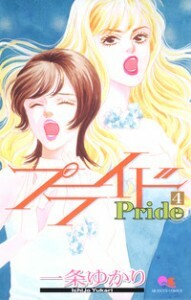 Pride is rapidly becoming one of my favorite series on Jmanga. This story of two rival opera singers always manages to put an interesting twist on showbiz manga with some unexpected plot twists. The rivalry between classy yet suddenly broke Shio and crawling up from the gutter Moe was firmly established in the first two volumes, and they are thrown together when they both get work at the same nightclub. Something unexpected occurs when they sing together though, their different voices end up blending in a delightful way. Ran thinks that the two women combined are his perfect diva and he is inspired to write even more of his own music for them. They join together in an unlikely trio called SRM, with both singers challenging each other to grow while Ran feels free to explore his avant-garde impulses. After seeing the antagonistic relationship between Shio and Moe, it was interesting to see how their commitment to music made them want to work together. One of the things that I enjoy about this series is the way that Shio and Moe are so forthright with each other about their mutual dislike. Moe basically states that she hates Shio, and Shio points out that Moe’s low character is also something that she despises. Moe announces that when they sing together she intends to use Shio as her foil to showcase her own voice, and Shio points out that if she intends to do that, Moe has to drastically elevate her technique. The fledgling trio actually starts to achieve a small amount of success when they get a chance to go on a variety show that has a singing and songwriting competition, but their chances of winning are derailed when a musical prodigy named Eiko also appears on the program as a surprise guest. It turns out the Eiko is the illegitimate half-sister of Shio’s wealthy fiance Mr. Jinno. Shio gets a glimpse of Jinno’s family life when she’s introduced to his parents, and she sees that Eiko has to sneak around in order to see her father. Jinno’s character begins to be revealed a bit more, and he is slightly more sympathetic, but still with the potential to do something scary if Shio crosses him. Just as Shio’s future life as a music company begins to take shape, Ran suddenly seems to be looking at her in a new way. Shio’s been able to take care of herself on her own for a bit, and the new levels of maturity and self-assurance begin to attract Ran. Shio keeps her engagement a secret because she doesn’t want to distract from SRM’s potential. As a character, Shio is still interesting after 4 volumes, because she just seems to sail through some difficult situations due to her strong sense of self. This is contradicted by her cold decision to become engaged to Jinno, but she’s also very pragmatic. When Shio sees the truth about Moe’s mother, she handles the situation with aplomb, and doesn’t use it as an excuse to strike back at her rival. Moe begins to recognize that her singing has been improved by being exposed to Ran’s music and Shio’s technique, but she still goes through life with raw emotional reactions. 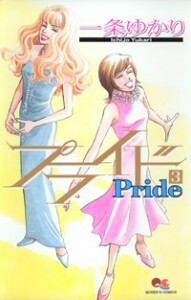 The contrast between the personalities and life situations of two protagonists in Pride really drives the series forward in a compelling way. The fourth volume ends in a bit of a cliffhanger, and I can’t wait for volume five.